Renovation of the cart paths on Lion’s Paw, Panther’s Run and Tiger’s Eye. Extensive sod re-nourishment on Panther’s Run. A vibrant, fresh updating of the Leopard’s Chase Clubhouse. 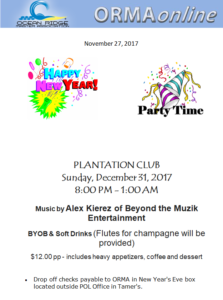 Celebrate the coming New Year at the Plantation Club!